There are so many recipes for this dish, but basically they all have a few commonalities. Onion, ginger and garlic purée and tomato base with additional ground spices. The names okra, bhindi and lady fingers are used interchangeably. 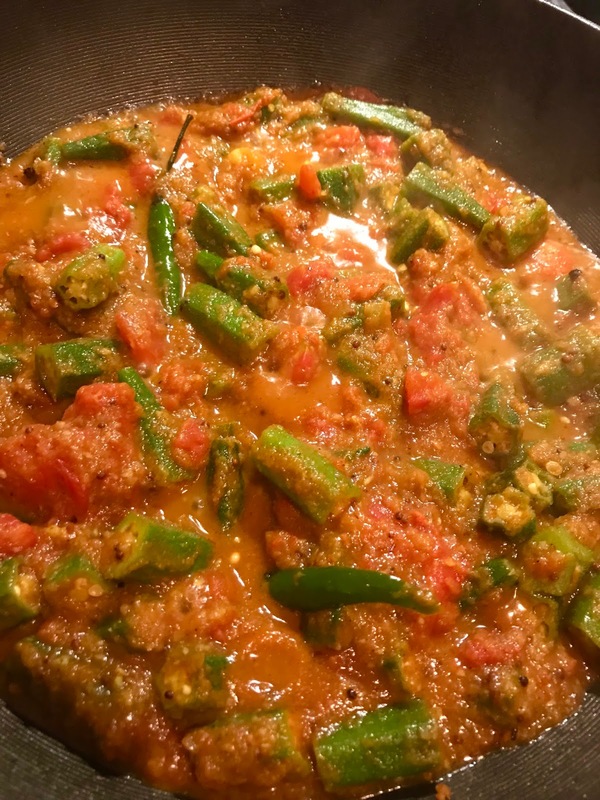 Some recipes include an additional step of precooking the bhindi/okra in half the oil and setting it aside. 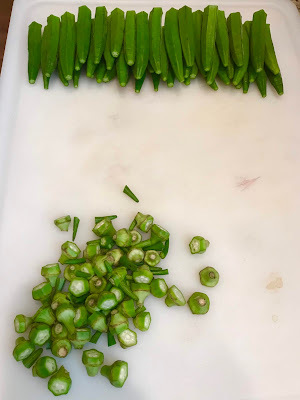 I can understand this, as it keeps the okra from getting slimy, which was a frequent concern in the recipes I read. 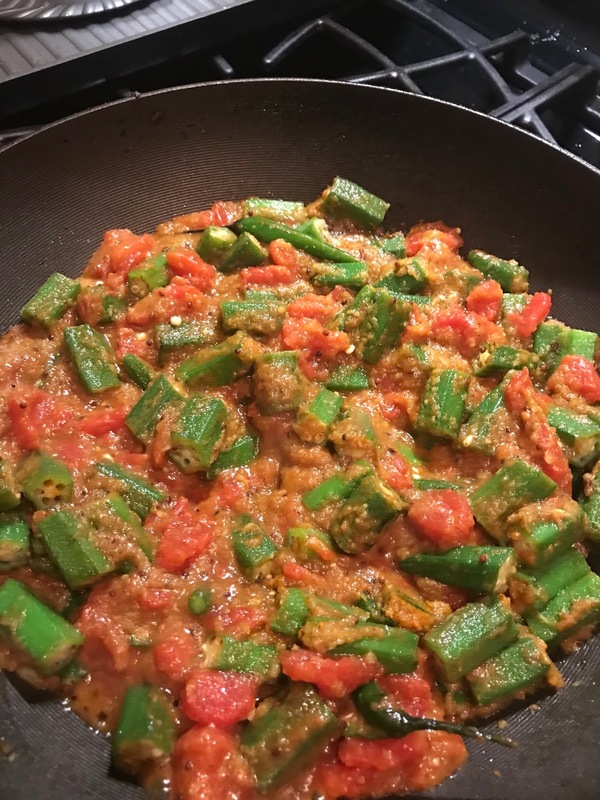 I was lucky in that my okra was very fresh, so I didn’t have that issue. Bottom line, if you are at the market and all the South Asian customers are buying okra, it is likely very fresh. 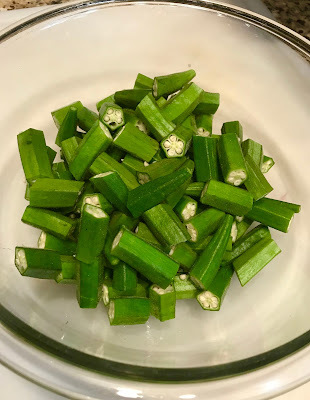 Additionally, many recipes called for adding something acidic to keep the okra from going slimy. I felt lemon juice would work well, and was happy with the results. One additional note. Many recipes called for using cumin seeds. As I had literally just run out, I substituted black mustard seeds. It tasted fine, but I think the cumin seed would have been slightly better. Prep the okra by washing them throughly and drying them completely. Cut off each end and then cut them into bite size pieces. I could have cut my pieces slightly smaller. Add the oil to your pan and add the black mustard or cumin seeds. Once they start popping, add your onion, garlic and ginger purée and allow it to turn slightly golden brown. Add the chili powder, turmeric and garam masala and salt and sauté for a minute or so to take off any rawness of the spices. 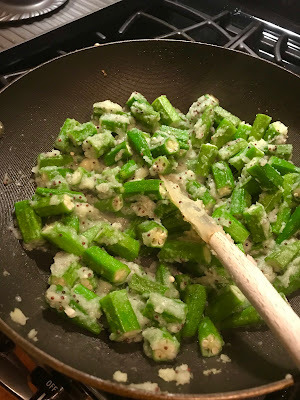 Add the okra and the lemon juice and cook for 6-8 minutes. Add the chopped tomatoes and fenugreek leaves, cover and cook for an additional 3-4 minutes. Uncover the pan and cook away any excess moisture. This is dry masala, so you don’t want it soupy.